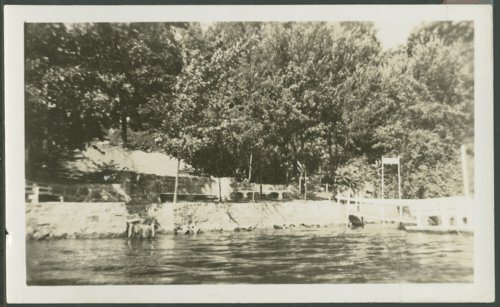 These three photographs shows dock sites at Lake Quivira, Kansas. The dock with shelter for a boat belonged to Dr. Larsen, the dock with chairs was Evans' Point, and the dock with a wall belonged to Frazier. Lake Quivira had 900 acres of restricted residentail and recreational property.